A pair of photos posted to social media claim to show glass panels for Apple's expected "iPhone SE 2," and if real, would hint at a significant redesign. The most obvious difference is the presence of an iPhone X-style notch towards the top, which would match a recent render shared by vendor Mobile Fun. 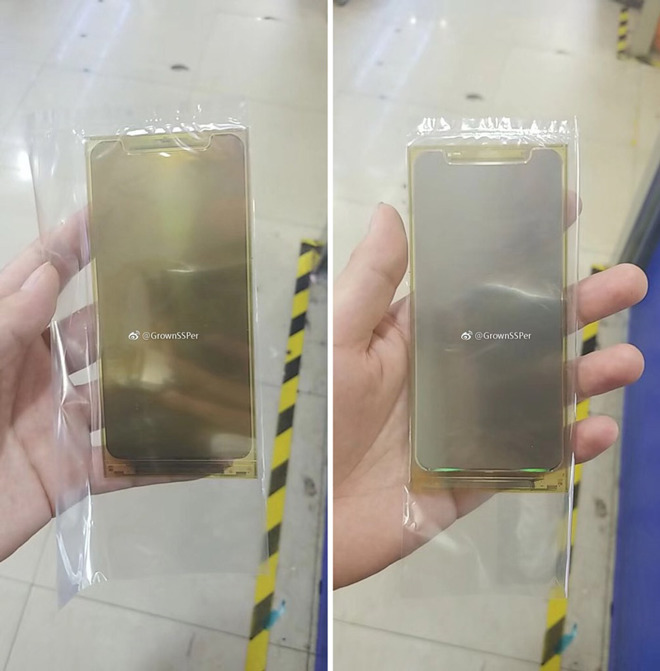 The panels, seen on China's Weibo, also appear to be notably larger than those for the existing iPhone SE, and closer in size to iPhone X glass, or to any number of notched Android phones. Together the factors seemingly point to the presence of a TrueDepth camera, Face ID, and/or an edge-to-edge display. That would conflict with other reports about the device however, which have suggested few external changes. In previous rumors, the phone has been pegged as getting internal upgrades like an A10 processor and possibly wireless charging. Conceivably an "SE 2" could simply have a bigger display, and use the notch for normal cameras and sensors, but given the phone's target audience and price, this seems unlikely. Additionally, the shape of the notch in the glass in Friday's pictures isn't quite the same as the one revealed by a case manufacturer on Thursday. Even Geskin seems to suspect that the glass is bogus. In a Tweet just prior to this "leak," he notes that his sources say that the "iPhone SE 2" is about the same externally as the iPhone SE is, but with a glass back. It's also not clear why the "iPhone SE 2" glass itself would have a notch cut into it, as opposed to a solid piece of glass like in the iPhone X. The original iPhone SE shipped in March 2016 and is often considered overdue for an update, particularly among people who enjoy its smaller 4-inch form factor. It uses the same general design as 2013's iPhone 5s, only enhanced with some of the features of 2015's iPhone 6s, such as a better processor. Apple would likely want to add technologies like Face ID to a new model, but the cost and complexity of manufacturing TrueDepth cameras means that in 2018 the feature will probably be reserved for this fall's flagship iPhones. The company is rumored to be preparing three products: 5.8- and 6.5-inch OLED models, and a cheaper 6.1-inch LCD alternative.